DeviceFidelity's CredenSE NFC microSD offers a neutral secure element on the Samsung Galaxy S4 to power mobile secure transaction apps from any provider across any wireless network. Having the CredenSE microSD secure element supported on phones like the Samsung Galaxy S4 makes deployment of security applications and services hassle-free. DeviceFidelity, Inc., the world’s leading NFC and security platform provider, today announced that the revolutionary CredenSE NFC microSD supports mobile wallet, mobile identity, access management and secure transaction apps on the recently released Samsung Galaxy S4 across all mobile carriers in all geographies, making it the world’s first NFC secure element solution that is open and accessible to any service provider globally. CredenSE features the company’s latest patented technology improvements and other enhancements including new secure elements with greater performance and increased memory capacity. The CredenSE NFC microSD easily fits existing business and distribution processes while providing issuer independence and supporting a wide variety of commercial models, paving the path for the mobilization of applications by security service provider. The end-user also receives greater benefits from the NFC microSD beyond expanding the phone storage, by making it easy to upgrade capabilities on their mobile phone or change mobile operators without losing the service or having to pay for re-issuance. The CredenSE portfolio leverages DeviceFidelity’s patented technology that allows for clean integration of NFC microSD products into phones that already have NFC technology built-in such as the Samsung Galaxy S4. In this case, the NFC microSD provides an additional Secure Element for NFC phones that is not dependent or controlled by one particular party, thereby enabling all types of institutions such as banks, transit operators, system integrators, but also enterprise and security tokens providers to deploy directly to their consumers. This targeted deployment approach is also useful for cost conscious TSM operators and mobile operators who are looking at reducing upfront costs while controlling access to the NFC capable security platform. Besides supporting the newly launched Galaxy S4, the DeviceFidelity neutral Secure Element solutions are also available for other globally popular smartphones such as the Galaxy S3, iPhone 5, iPhone 4S and Blackberry Z10. CredenSE is the world’s first commercial NFC product with on board active signal amplification chip, industry leading Secure Element and miniature antenna, making it the only Secure Element microSD that can host mobile wallet applications on both NFC and non-NFC phones. CredenSE product line offers a wide choice of user memory up to 8GB with a variety of onboard Secure Elements that are compatible with industry standards such as EMV, Global Platform, ISO 14443, FIPS 140 and Java Card. The flagship of the product line, CredenSE 2.10, features a powerful Secure Element that can not only support payment applications from VISA, MasterCard, American Express, Discover and China UnionPay but also features support for MiFare and HID’s MultiClass SEOS solution. CredenSE 2.10 delivers a robust platform of choice for a complete range of payment, transit and access control solutions. DeviceFidelity will be presenting at the NFC Solutions Summit in San Francisco, on May 15th, 2013. During the event, DeviceFidelity representatives will be available to discuss how the DeviceFidelity solution can benefit you, demonstrate the product on the Galaxy S4 as well on the iPhone5, and help answer any questions you may have around neutral; secure elements. DeviceFidelity, Inc. develops plug-and-play technologies that empower a variety of institutions to deploy their services and applications on millions of mobile phones worldwide. 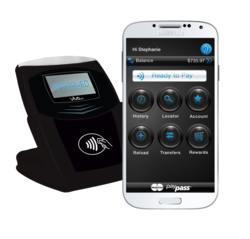 Its patented CredenSE and In2Pay® microSD and iCaisse for iPhone solutions transform popular mobile phones into an interactive contactless transaction device. Committed to bringing contactless innovation to the mobile phone, the company launched moneto, the world’s first multi-platform mobile wallet in the US. DeviceFidelity is a private corporation with headquarters in Richardson (Texas) and offices in San Mateo (California), and Aix-En-Provence (France). For more information visit devicefidelity.com, follow us on Twitter @devicefidelity and at facebook.com/DeviceFidelity.